A common cliché of our time is to observe that the internet has made us more connected than ever. Although historians might question the accuracy of this statement, the web, social media, and smart phone apps have allowed new opportunities for engagement with historical artifacts, stories, and landmarks. One only has to look at Canada’s largest city. Numerous initiatives in Toronto have begun to promote the city’s heritage. Here’s a look at some of these projects. 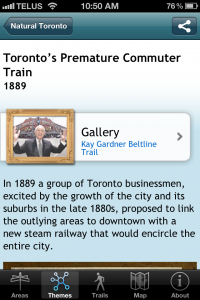 Since going live in October 2012, the Toronto in Time mobile app has enabled users to experience the history of Toronto through thematic trails, historical photographs, and written text. The app developed out of a partnership of The Canadian Encyclopedia, the Historica-Dominion Institute, Museum Services of the City of Toronto, and Heritage Toronto, with funding from the Ontario Ministry of Tourism, Culture and Sport, and the Federal Department of Canadian Heritage. The app is organized by historical theme and geographic area. Themes include Arts & Entertainment, Planning Toronto, Law & Order, Transportation & Communication, and First Peoples. The app also includes stories on more contentious aspects of the city’s past, like slum conditions in The Ward (the area near present-day Nathan Phillips Square) during the early twentieth century and anti-Greek riots that broke out in August 1918. Although other areas of the Megacity are represented, stories about the downtown dominate. This is no surprise. As ActiveHistory.ca’s Tom Peace has observed, Toronto’s heritage infrastructure is highly clustered in the old City of Toronto. David Wencer, a Toronto-based heritage advocate and blogger who contributed text to the app, also thinks it would benefit from more content about areas outside the old City of Toronto such as Etobicoke, Scarborough, and North York. These areas certainly don’t lack history, and the many stories about their rampant postwar development would make a welcome addition to the app. In fact, users can contribute by suggesting story ideas for future upgrades. As we see here, the connectivity of the web allows for the crowdsourcing of historical knowledge and material – or at least avenues for future exploration. Two generalist Toronto blogs with large followings also include strong historical angles to their content. BlogTO features numerous articles about the city’s past with an emphasis on historical photographs. Its “photos by decade” collection has been extremely popular. At the Torontoist, a dedicated group of writers have made the Historicist an exciting weekly feature dedicated to “the events, places and characters that have shaped Toronto into the city we know today.” Its writers – Jamie Bradburn, Kevin Plummer, and David Wencer – scour digitized newspapers, archival material, secondary sources to uncovering fascinating stories about the city’s past. Quite often, weekly articles relate to a current event, whether it be the holiday season or opening day for the Blue Jays. A recent favourite of mine is Bradburn’s article on the nascent development of cycling infrastructure in the 1970s – certainly a topic of contemporary relevance with the usually hot debate over the place of cycling on the city’s streets. Another popular initiative is using Facebook to provide a daily feed of historical photographs of the city for heritage buffs. Vintage Toronto, the brainchild of Bill Stevenson, has racked up almost 40,000 “likes” since it began in January 2012. Although Stevenson now operates a store that sells historic items in Kingston, he spent two decades in Toronto from the 1960s to the 1980s. The Toronto Star reported that a similar Facebook group devoted to Los Angeles’ history inspired Stevenson to start group about Toronto. The Toronto group has fans across the world, from Korea to Israel, to right here in the city of course. Nostalgia pervades the group. Thanks in part to its use of “then and now” images of the city (a common technique for many visual-based, online history projects, as Kaitlin Wainwright recently discussed here on ActiveHistory.ca), many comments exude an anti-development – and especially anti-condo – perspective. “It’s probably a condo now,” is a common response to photographs of historic buildings from followers. Yet these comments, along with the historical images featured on Vintage Toronto, offer a chance for dialogue about change and continuity of today with the past. Others followers have responded to comments similar to this one by emphasizing the complexity of the past. For example, one follower questioned the supposed innocence of earlier times by mentioning the various exclusion acts against the Chinese that existed in the late nineteenth and early twentieth centuries. Although we may think that Toronto of earlier decades was a simpler place, the follower argued, these eras saw oppression towards various social groups. Most of Vintage Toronto’s images come from official sources of memory such as the City of Toronto Archives and the Toronto Public Library. But as the Facebook group has grown, so have the thousands of private images of memorabilia and family photos. In this sense, Vintage Toronto has become a virtual archive where ordinary people share their personal artifacts of the past. Like Toronto in Time, Vintage Toronto illustrates how Facebook can facilitate new historical knowledge through a basic form of crowdsourcing. 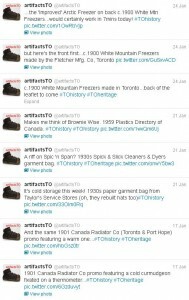 The Collections & Conservation Centre of the City of Toronto’s Museum Services uses a regular twitter feed – @artifactsTO – to highlight objects from its collection of historical artifacts. The initiative gives nearby 600 followers the chance to check out the material history of the city, from exemplary to mundane items of everyday life in the city. ArtifactsTO recently featured a “cold storage week” with tweets that included links to different fridges, freezers, and advertisements for such technologies (see right). The projects outlined above show how digital and social media can help us forge strong connection to our pasts, whether it be through official histories or very personal memories. And there are more opportunities. Unlike other major cities, no regular podcast about Toronto’s history exists (although Heritage Toronto does feature podcasts from its talks, roundtables and walking tours). New York has The Bowery Boys podcast hosted by Greg Young and Tom Meyers. One of my favourite episodes is their conversation about the exciting history of brewing in the metropolis. A Toronto history podcast would be an excellent compliment to the Toronto in Time mobile app. Augmenting the app’s visual sources with sound could allow users to experience a multi-sensorial dimension to the walking tours. 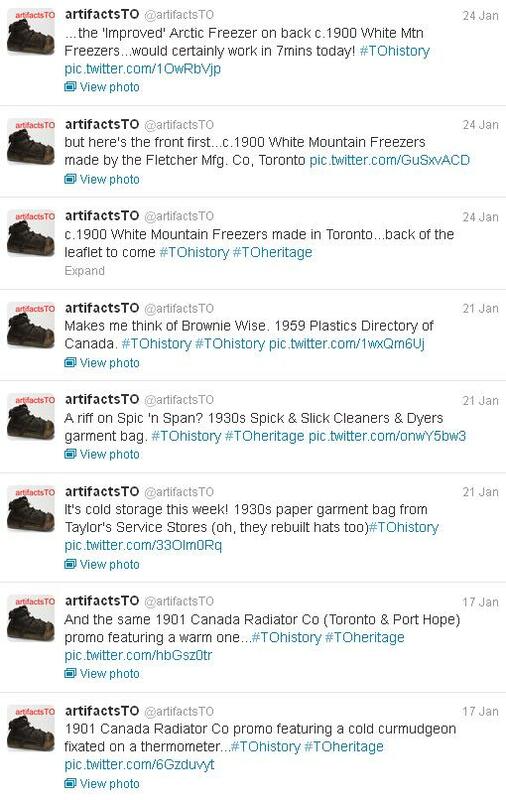 What other examples of promoting Toronto’s history through digital and social media have I missed? What exciting initiatives are happening in other cities? We would love to hear from you in the comment section. Jay Young is an editor at ActiveHistory.ca. He holds a PhD in history from York University. Excellent review post, Jay. How is Toronto doing on History Pin? Just curious. First Story, from the Toronto Native Community History Project, explores sites of aboriginal history in Toronto. It’s unfortunately only available for Android and Google Play, but worth looking at! A very welcome post, Jay. Happy to see I follow all of these regularly. The TXTilecity app and website also launched this past summer from the Textile Museum of Canada. It uses a similar mapping interface as Toronto in Time and First Story, with a major emphasis on original video and audio content. http://www.txtilecity.ca, available also on the App Store, Google Play and for BlackBerry. I would definitely recommend checking it out. Thanks Sean, Kaitlin, and Shawn! Sean: a number of photo clusters exist for Toronto on History Pin, but there still are many holes on the map. I’m not sure how this compares to other cities. The City of Toronto Archives has many of its digitized photographs featured on Flickr, and History Pin seems like a great interface for these photographs (of course, someone has to spend the time uploading all of them). Kaitlin: First Story looks great. Thanks for passing it along! Shawn: great to hear about the TXTilecity app and website. The audio/video content is a cool addition too. TXTilecity was passed along in a tweet about my article, so clearly the word is getting out! Goad’s Atlas of Toronto — Online! Featuring easy to use access to Atlases for the years 1884, 1890, 1893, 1899, 1903, 1910, 1913, and 1924. Also posted are the Insurance Plans of the City of Toronto for the years 1880 and 1889, as well as a bonus article on the Toronto Fires of 1904 and 1895. A collection of amusing, delightful, and informative pre-1900 maps of our fair city. Highlights include the 1858 Boulton Atlas of Toronto (with a key map! ), a high-resolution scan of the 1842 Cane Topographical Map of the City and Liberties of Toronto, and the oft-overlooked 1834 Alpheus Todd Engraved Map of the City of Toronto, denoting over 50 structures of significance in the recently incorporated city. The two sites leverage digitization efforts by the TPL, CTA, LAC, etc. to present the maps in a simple format that is accessible to anyone with a web browser.